Track your life, notice trends. Take control of your health and wellbeing with Hemisphere, a custom life-tracker. Enter your questions, choose their type and place them in the order you want. 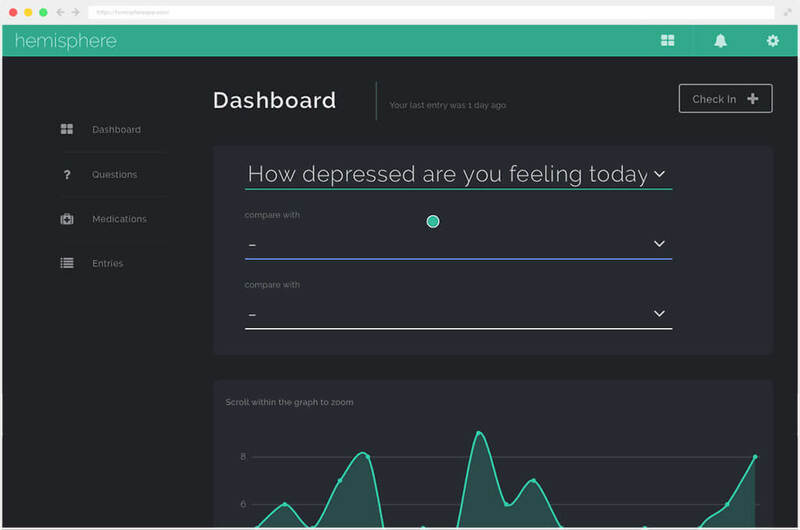 With as many questions as you want, and used to measure absolutely anything, Hemisphere allows you to keep track of you, your mental health and what matters in your life. When you're ready, "check in" to answer your questions as you defined and ordered them. Check in as often or as little as you like. With all answers encrypted, you can rest assured that your answers will only be viewed by you. Once you've checked in, compare answers and notice trends in the interactive graphs. Hemisphere allows you to keep track of yourself in a way you choose. Notice trends and stay mindful of your actions, objectively. As many questions as you need. In the order you want them. You know you best. Choose and write your own questions and put them in an order that makes sense to you. No more tracking symptoms or factors that don’t apply to your life: with Hemisphere you can have full control over the sort of questions you answer and the responses you gather. Whether it’s two questions or twenty, control is in your hands. Create and receive custom alerts. Want to keep yourself accountable, or alert people if you haven’t checked in? Alerts give you and your support network a way to stay connected. Set custom alerts to let yourself or other people know if you haven’t checked in a while. Whether it’s to help you stay in the habit, or to keep you safe, alerts let you keep the people important to you in the loop. Easy to use and good looking to boot. We got a little sick of clinical looking websites and childlike apps, so we’ve made hemisphere good for the eyes as well as the mind. We won’t ask you to represent your mood with an emoji or subject you to outdated, hard to use tech. Instead, we’ve kept it clean, simple and a little bit funky. Want to track and compare energy with exercise? How about work, fatigue and sleep? Track and compare anything you like. Check in as many times as you need. Ready for something a little bit extra? Or learn more about Hemisphere.